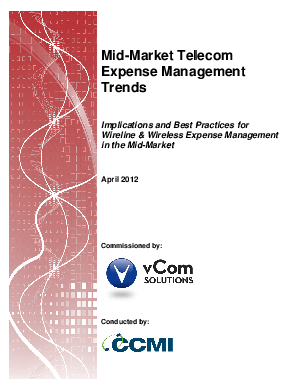 CCMI and vCom Solutions surveyed 100 U.S.-based firms with annual revenues of $25 million to $500 million to pinpoint the key issues organizations of this size face as the size and complexity of their telecom environments grow. These enterprises now use many complex wireless and wireline services as well as multiple communications service providers, but there has not been a commensurate increase in technical and analytical skill sets to effectively manage the procurement, deployment and expense associated with the services. This report identifies the real challenges mid-market businesses face, measures the true scope of the problem, and examines available alternative solutions.